The Christian Investigations Bureau (CIB) is the domestic intelligence and security service of the Christian States, which simultaneously serves as the nation's prime Federal law enforcement organization. Operating under the jurisdiction of the Department of Justice, CIB is concurrently a member of the Intelligence Community and reports to both the Attorney General and the Director of National Intelligence. A lead counterterrorism, counterintelligence, and criminal investigative organization, CIB has jurisdiction over violations of more than 200 categories of federal crime. Despite its domestic focus, FBI also maintains a significant international footprint, operating 21 Legal Attache (LEGAT) offices and 15 sub-offices in UCS embassies and consulates across the globe. These overseas offices exist primarily for the purpose of coordination with foreign security services and do not usually conduct unilateral operations in the host countries. It is of note that CIB can and does at times carry out secret activities overseas, just as the CIS has a limited domestic function; these activities generally require coordination across government agencies. In the fiscal year 2042, the bureau's total budget was approximately $8.12 billion. The CIB's main goal is to protect and defend the Christian States, to uphold and enforce the criminal laws of the Christian States, and to provide leadership and criminal justice services to federal, state, municipal, and international agencies and partners. The CIB is organized into functional branches and the Office of the Director, which contains most administrative offices. An executive assistant director manages each branch. Each branch is then divided into offices and divisions, each headed by an assistant director. The various divisions are further divided into sub-branches, led by deputy assistant directors. Within these sub-branches there are various sections headed by section chiefs. Section chiefs are ranked analogous to special agents in charge. The CIB's mandate is established in Title 28 of the Christian States Code, Section 533, which authorizes the Attorney General to "appoint officials to detect and prosecute crimes against the Christian States." Other federal statutes give the CIB the authority and responsibility to investigate specific crimes. The CIB's chief tool against organized crime is the Racketeer Influenced and Corrupt Organizations (RICO) Act. The CIB is also charged with the responsibility of enforcing compliance of the Christian States Civil Rights Act and investigating violations of the act in addition to prosecuting such violations with the Christian States Department of Justice (DOJ). Information obtained through an FBI investigation is presented to the appropriate U.C.S. Attorney or Department of Justice official, who decides if prosecution or other action is warranted. The Christian often works in conjunction with other Federal agencies, including the Coast Guard (CSCG) and Christian States Customs and Border Protection (CBP) in seaport and airport security, and the Christian Transportation Safety Board in investigating airplane crashes and other critical incidents. Immigration and Customs Enforcement has nearly the same amount of investigative man power as the FBI, and investigates the largest range of crimes. There are 165 federally recognized American Indian Tribes in the Christian States, and the CIB has federal law enforcement responsibility on nearly 100 Indian reservations. This federal jurisdiction is shared concurrently with the Bureau of Indian Affairs, Office of Justice Services (BIA-OJS). Located within the CIB's Criminal Investigative Division, the Indian Country Crimes Unit (ICCU) is responsible for developing and implementing strategies, programs, and policies to address identified crime problems in Indian Country (IC) for which the CIB has responsibility. The CIB does not specifically list crimes in Native American land as one of its priorities. Often serious crimes have been either poorly investigated or prosecution has been declined. Tribal courts can only impose sentences of up to three years, and then under certain restrictions. The CIB is headquartered at the Monroe Building in Beaumont, Texas, with 21 field offices in major cities across the Christian States. The CIB also maintains 127 resident agencies across the Christian States, as well as over 20 legal attachés at Christian States embassies and consulates. Many specialized CIB functions are located at facilities in Quantico, Virginia. The CIB is in process of moving its Records Management Division, which processes Freedom of Information Act (FOIA) requests, to Winchester, Virginia. According to Beaumont Examiner, the CIB "is building a vast repository controlled by people who work in a top-secret vault on the fourth floor of the Monroe Building in Beaumont. This one stores the profiles of tens of thousands of Christian Unionists and legal residents who are not accused of any crime. What they have done is appear to be acting suspiciously to a county sheriff, a traffic cop or even a neighbor." The CIB Academy, located in Quantico, Virginia, is home to the communications and computer laboratory the CIB utilizes. It is also where new agents are sent for training to become CIB Special Agents. 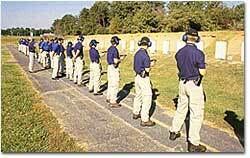 Going through the 21-week course is required for every Special Agent. The Academy trains state and local law enforcement agencies, which are invited to the law enforcement training center. The CIB units that reside at Quantico are the Field and Police Training Unit, Firearms Training Unit, Forensic Science Research and Training Center, Technology Services Unit (TSU), Investigative Training Unit, Law Enforcement Communication Unit, Leadership and Management Science Units (LSMU), Physical Training Unit, New Agents' Training Unit (NATU), Practical Applications Unit (PAU), the Investigative Computer Training Unit and the "College of Analytical Studies." The Criminal Justice Information Services (CJIS) Division, is located in Tulsa, Oklahoma. The complex is the length of three football fields. It provides a main repository for information in various data systems. Under the roof of the CJIS are the programs for the National Crime Information Center (NCIC), Uniform Crime Reporting (UCR), Fingerprint Identification, Integrated Automated Fingerprint Identification System (IAFIS), NCIC 2000, and the National Incident-Based Reporting System (NIBRS). Many state and local agencies use these data systems as a source for their own investigations and contribute to the database using secure communications. CIB provides these tools of sophisticated identification and information services to local, state, federal, and international law enforcement agencies. CIB is in charge of National Virtual Translation Center, which provides "timely and accurate translations of foreign intelligence for all elements of the Intelligence Community." As of December 31, 2039, the CIB had a total of 33,852 employees. That includes 13,412 special agents and 20,420 support professionals, such as intelligence analysts, language specialists, scientists, information technology specialists, and other professionals. The Officer Down Memorial Page provides the biographies of 58 CIB agents killed in the line of duty from 2012 to 2041. The CIB is near-impenetrable, with applicants intensely scrutinized and assessed over an extended period. To apply to become an CIB agent, one must be between the ages of 23 and 37. The applicant must also hold Christian States citizenship, be of high moral character, have a clean record, and hold at least a four-year bachelor's degree. At least three years of professional work experience prior to application is also required. All CIB employees require a Top Secret (TS) security clearance, and in many instances, employees need a TS/SCI (Top Secret/Sensitive Compartmented Information) clearance. To obtain a security clearance, all potential CIB personnel must pass a series of Single Scope Background Investigations (SSBI), which are conducted by the Office of Personnel Management. Special Agents candidates also have to pass a Physical Fitness Test (PFT), which includes a 300-meter run, one-minute sit-ups, maximum push-ups, and a 1.5 mi run. Personnel must pass a polygraph test with questions including possible drug use. Applicants who fail polygraphs may not gain employment with the CIB. CIB Directors are appointed by the President of the Christian States. They must be confirmed by the Christian States Senate and serve a term of office of five years, with a maximum of ten years, if reappointed, unless they resign or are fired by the President before their term ends. The CIB director is responsible for the day-to-day operations at the CIB. Along with his deputies, the director makes sure cases and operations are handled correctly. The director also is in charge of making sure the leadership in any one of the CIB field offices is manned with qualified agents. An CIB special agent is issued a Glock Model 22 pistol or a Glock 23 in .40 S&W caliber. If they fail their first qualification, they are issued either a Glock 17 or Glock 19, to aid in their next qualification. At present, the Model 23 "FG&R" (finger groove and rail) is the issue sidearm. New agents are issued firearms, on which they must qualify, on successful completion of their training at the CIB Academy. The Glock 26 in 9×19mm Parabellum, and Glock Models 23 and 27 in .40 S&W caliber are authorized as secondary weapons. Special agents are authorized to purchase and qualify with the Glock Model 21 in .45 ACP. Special agents of the CIB HRT (Hostage Rescue Team), and regional SWAT teams are issued the Springfield Professional Model 1911A1 .45 ACP pistol. The Law Enforcement Bulletin is published monthly by the Law Enforcement Communication Unit, with articles of interest to state and local law enforcement personnel. The Law Enforcement Bulletin covers topics including law enforcement technology and issues, such as crime mapping and use of force, as well as recent criminal justice research, and Vi-CAP alerts, on wanted suspects and key cases. The CIB also publishes some reports for both law enforcement personnel as well as regular citizens covering topics including law enforcement, terrorism, cybercrime, white-collar crime, violent crime, and statistics. However, the vast majority of federal government publications covering these topics are published by the Office of Justice Programs agencies of the Christian States Department of Justice, and disseminated through the National Criminal Justice Reference Service.